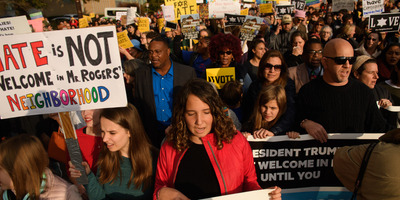 Jeff Swensen/Getty ImagesAn estimated 4,000 people gathered to march for solidarity in the Squirrel Hill neighbourhood while President Donald Trump was visiting October 30, 2018 in Pittsburgh, Pennsylvania. The march was in support of the victims of the Tree of Life mass shooting October 27, 2018. 1. 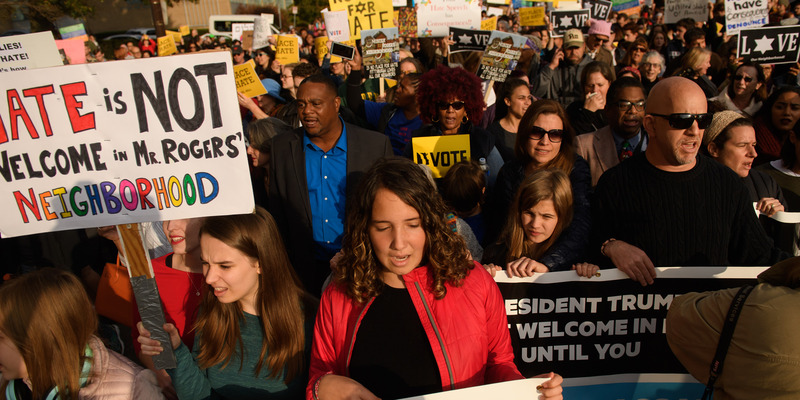 Observers gave Trump an icy welcome as his motorcade travelled to a synagogue shooting memorial in Pittsburgh. The shooting at the Tree of Life synagogue on Saturday left 11 Jewish worshippers dead. 4. Apple held its second big event of the fall, showing off its lineup of new iPad Pros, Mac computers, and more. Apple unveiled a new redesigned MacBook Air and a new Mac mini. 5. At least nine people were killed and dozens more are trapped as powerful Typhoon Yutu struck the northern Philippines. This is the second powerful typhoon to strike the region, following the deadly Typhoon Mangkhut last month. 6. Facebook is banning far-right militia The Proud Boys.Earlier in October, five members of the Proud Boys were arrested after a violent incident with protesters in New York City. 7. The US Department of Justice is accusing Chinese intelligence officers of stealing sensitive information from aviation companies.The DOJ says over a dozen US and European aviation companies were hacked over a period of more than five years. 8. Indonesian search and rescue workers have detected a 72 foot (22 meter) long object underwater in the area where a Lion Air plane crashed. The new 737 plunged into the Java Sea on Monday just after taking off from Jakarta, killing all 189 people on board. 9. At least 7 people are dead in Afghanistan after a suicide bombing outside a prison. The attacker targeted a bus carrying prison workers. No one has taken immediate responsibility for the attack. 10. Scientists are terrified that Brazil’s new president will destroy the “lungs of the planet.“ Jair Bolsonaro has indicated he wants to plow through Brazil’s Amazon, the Earth’s biggest and most diverse tropical rainforest, which helps cool the planet. One ticket, two days, 50+ insightful speakers, and 600+ executives.One ticket, two days, 50+ insightful speakers, and 600+ executives.Business Insider’s flagship IGNITION conference headliners include Mark Cuban, Janice Min, Sir Martin Sorrell and Barbara Corcoran. Join us for IGNITION, December 3-4, New York City.